Civil Rights-Attorney Simpson has more than 16 years of experience in representing public employees and public entities in the defense of civil rights claims brought before the Federal and State Courts. Attorney Simpson has obtained favorable results for his clients through trial, dispositive motions and mediations/settlements. He has been lead counsel in over 12 successful civil jury trials involving civil rights claims against public entities and public officials. He has obtained dismissal of numerous civil rights claims prior to trial by successful motion practice. Lastly, he has successfully defended and argued several claims before the United States Court of Appeals involving complex civil rights issues. Wage and Hour-Attorney Simpson has represented hundreds of individuals in wage and hour litigation under the Massachusetts Wage Act and under the Fair Labor Standards Act. Attorney Simpson has maintained a class action practice representing individuals who have been not paid overtime, meal breaks, had unlawful deductions from their pay or have been misclassified as an indepedent contractor. Municipal Liability-Attorney Simpson has represented numerous municipalities throughout the Commonwealth in a wide variety of claims including civil rights claims, employment claims including whistleblower and First Amendment actions. 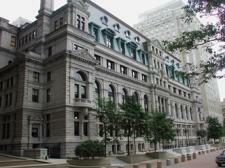 He has defended municipalities in claims brought under the Massachusetts Tort Claims Act (G.L. c. 258), Defect in Way Claims and claims brought under the recreational use statute. Attorney Simpson has obtained dismissal of many of these claims prior to trial by way of motion practice. The end result being a cost effective defense of these claims. Police Misconduct Defense-Attorney Simpson has represented hundreds of law enforcement officials in the past ten years in a wide variety of civil and criminal litigation. Attorney Simpson has been repeatedly successful in obtaining dismissal of criminal complaints brought against police officers. Labor and Employment Law-Attorney Simpson has represented individuals in employment disputes with their employers. Attorney Simpson has represented numerous employees in wage and hour disputes with their employers which have resulted in significant settlement amounts for employees. Administrative Law-Attorney Simpson has represented numerous public employees before the Civil Service Commission involving disciplinary appeals, bypass appeals and retirement issues. In the past year alone, he has successfully overturned two termination decisions involving public employees resulting in significant back pay awards for those individuals. He has also successfully argued several bypass appeal cases before the Civil Service Commission for public employees. Personal Injury-Attorney Simpson has significant experience in representing injuries persons in all facets of tort law including motor vehicle accidents, slip and falls, construction defects and other negligence areas. Attorney Simpson’s representation of injured persons goes beyond “getting what you deserve” but a dedicated, responsive and aggressive approach to resolving injury claims to the client’s satisfaction. Criminal Law-Attorney Simpson has experience in representing individuals before the District and Superior Courts in a wide variety of criminal cases including , simple assaults, battery, and operating under the influence. Real Estate-Attorney Simpson has significant experience in representing buyers and sellers in residential real estate transactions including offers, purchase and sales and closings. Small Business-Attorney Simpson currently represents several small business in all facets of operation including formation, employment matters, debt collection and general litigation. Wills and Trusts-representation of individuals in the formation of estate plans, health care proxies and living wills.